Dave and Trissie were expecting Amber when I visited China in 2012, so I was long over-due to see my youngest grandchild. 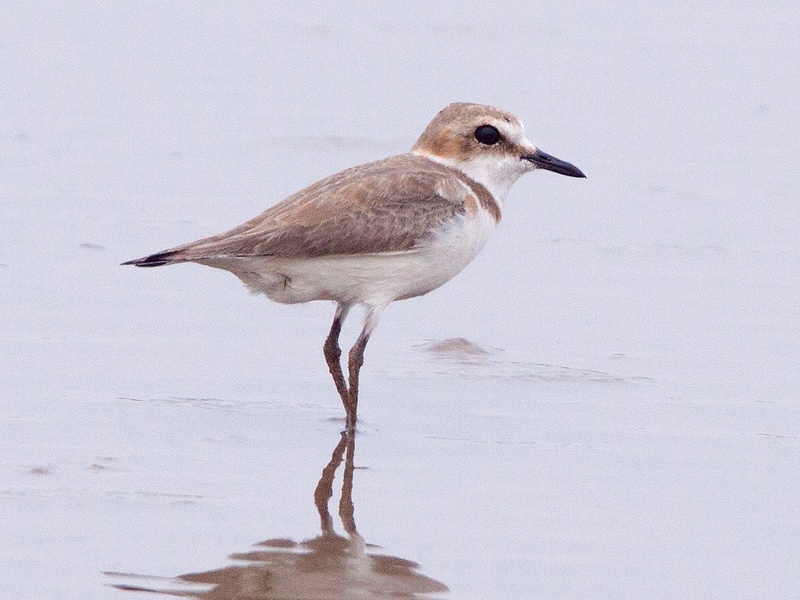 I wanted to visit in winter when I could also see wintering birds at Poyang Lake. 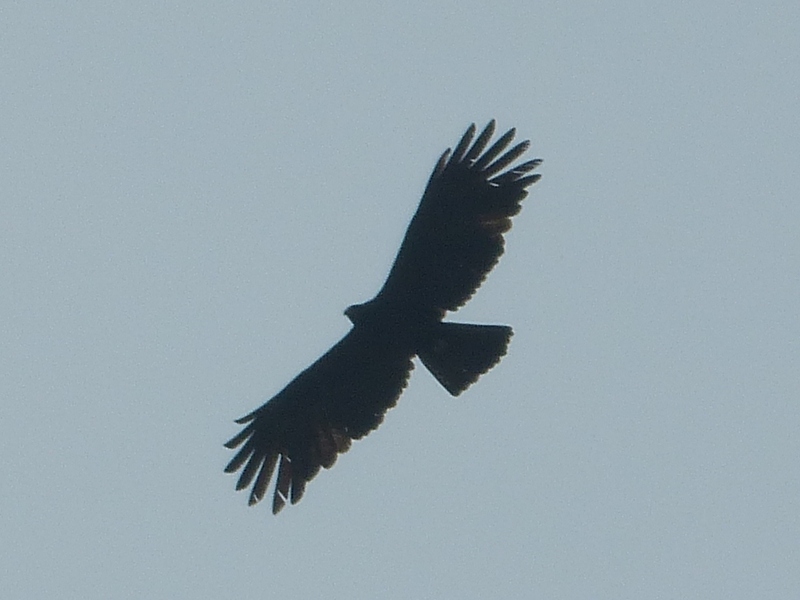 So, my targets for this trip were Siberian, Hooded, and White-naped Cranes; Oriental Storks; and 18-month old Amber. Well, I wanted to see Scaly-sided Mergansers, too, but I couldn’t figure out how to fit that into the title of this post. 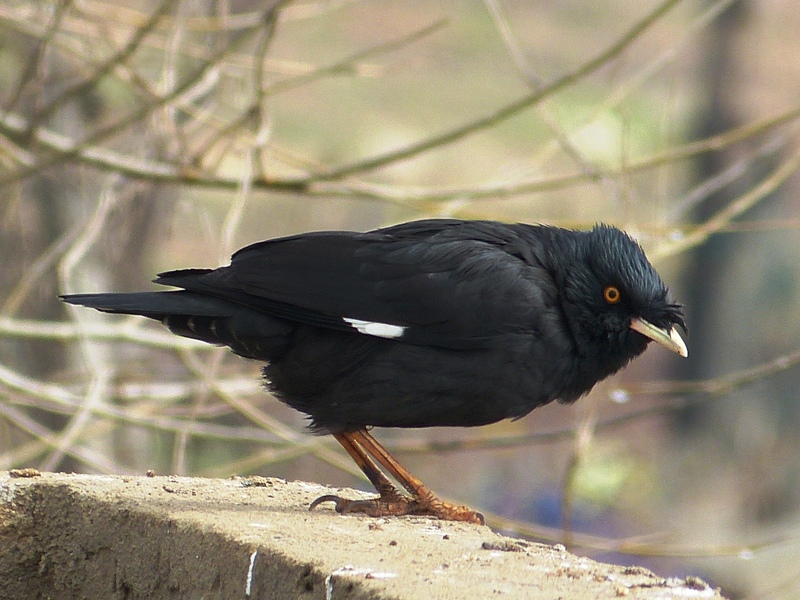 My original plans were to leave home on February 14, spend a few days with my family and rest, and then fly to Nanchang for four days of birding. However, winter storms delayed my departure and I was not able to leave until February 17. I arrived in Hong Kong at 10:30 PM on the 18th and left the next morning for Nanchang. The Nanchang flight was delayed, too, due to weather, but we didn’t know that until we arrived at the Shenzhen airport. I sent Dave home and sat there alone waiting for my flight. The airport was so cold that I was shivering even with a thick Sherpa fleece, I was exhausted, I had a headache, and my shoulder and tummy hurt. Menxiu Tong of China Wild Tour had been our local guide for the 2012 Zoothera trip and I was looking forward to birding with him again. Menxiu met me in Nanchang as planned and we had dinner and a good night’s rest. 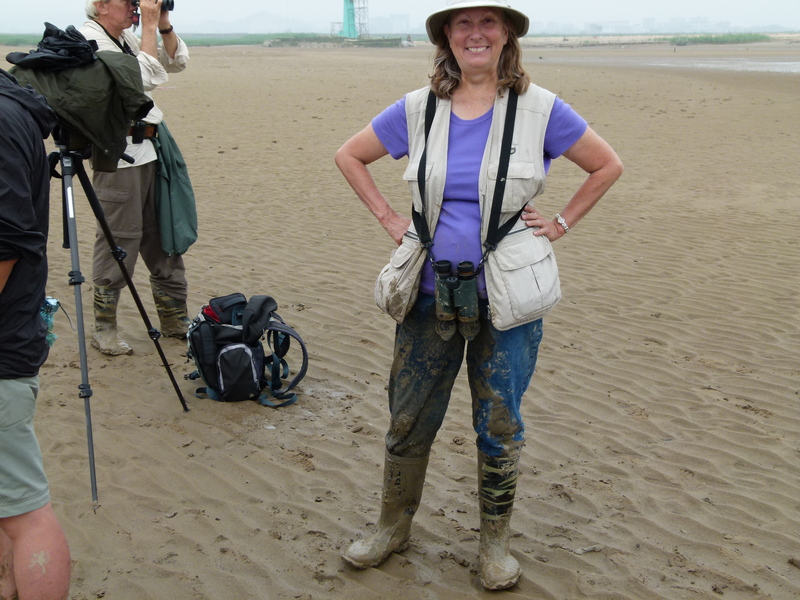 The next morning, Thursday, February 20, we headed to Poyang Lake. 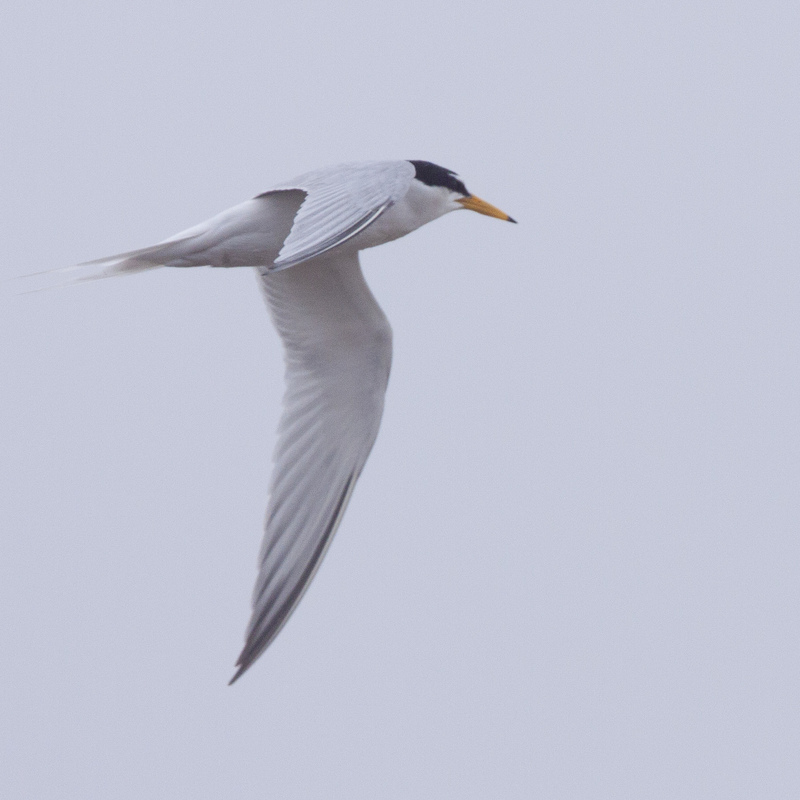 Our birding got off to a slow start due to cold and fog, but we found quite a few birds as the day warmed up, including two of our targets – Oriental Stork and Hooded Crane. 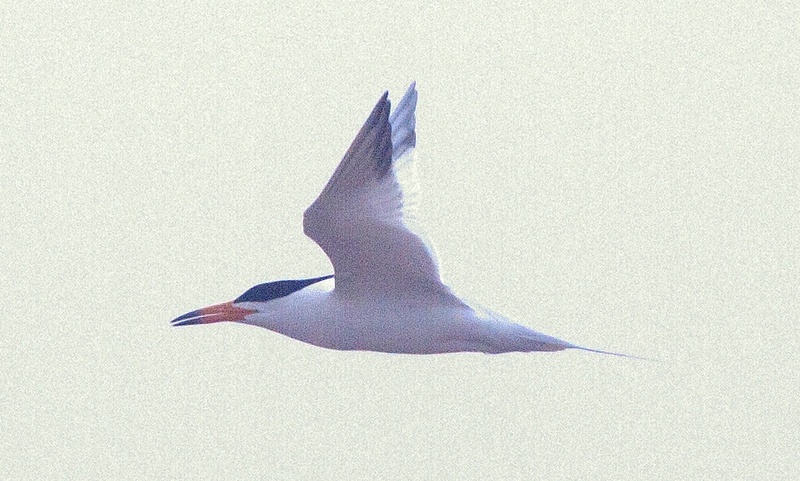 We did not get as close to the birds as I had hoped, but we had satisfying scope views. 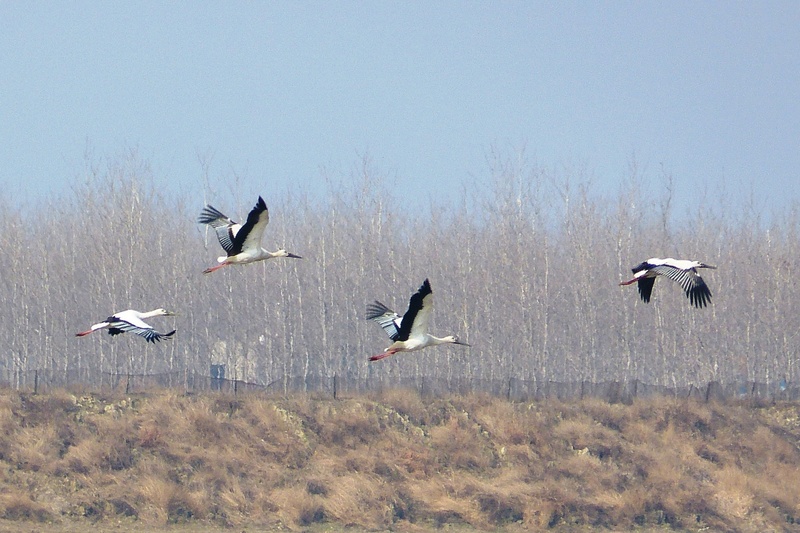 On Friday, we found the other three crane species that regularly winter at Poyang Lake – Siberian, Common, and White-naped. 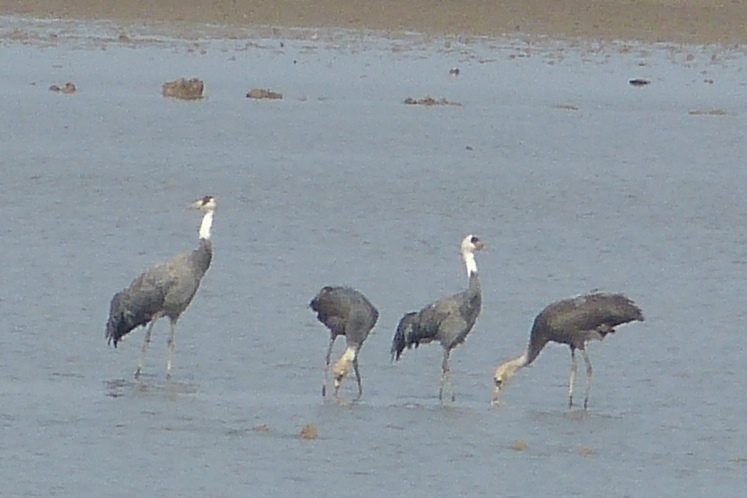 The White-naped Cranes were quite far out, but unmistakable. 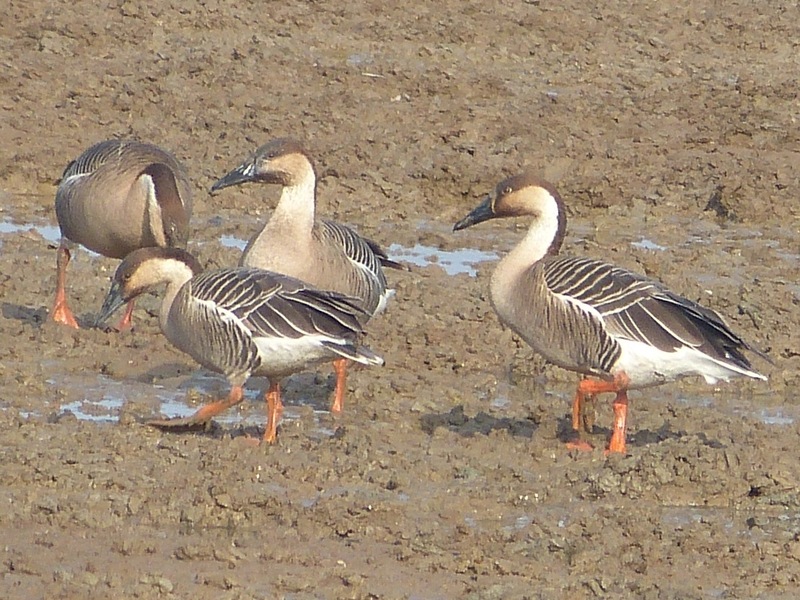 Another species that I particularly enjoyed was Swan Goose. We had long, close looks at a flock near the road. After lunch on Friday, we headed to Wuyuan, where our target was Scaly-sided Merganser. 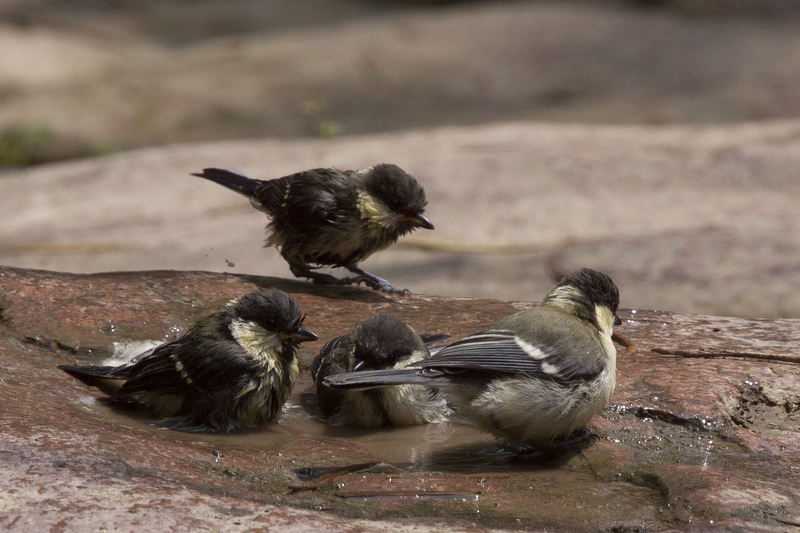 Wuyuan had been one of my favorite locations in 2012 and we returned to some of the same birding spots on Saturday. First was the jungle path with rice paddies on one side and the river on the other. We had hoped to find the mergansers on the river there, but we did not see them, so we enjoyed the birds that we did find. 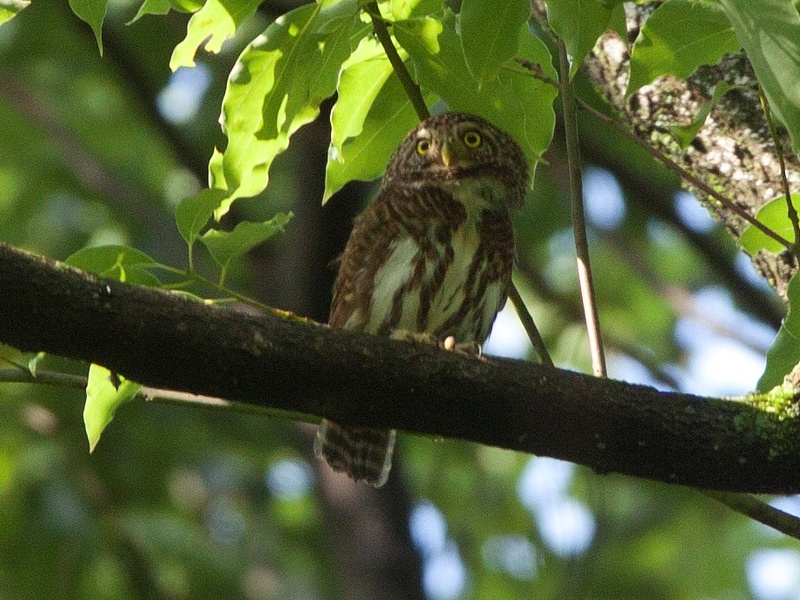 It was especially nice to have great looks at a Collared Owlet. 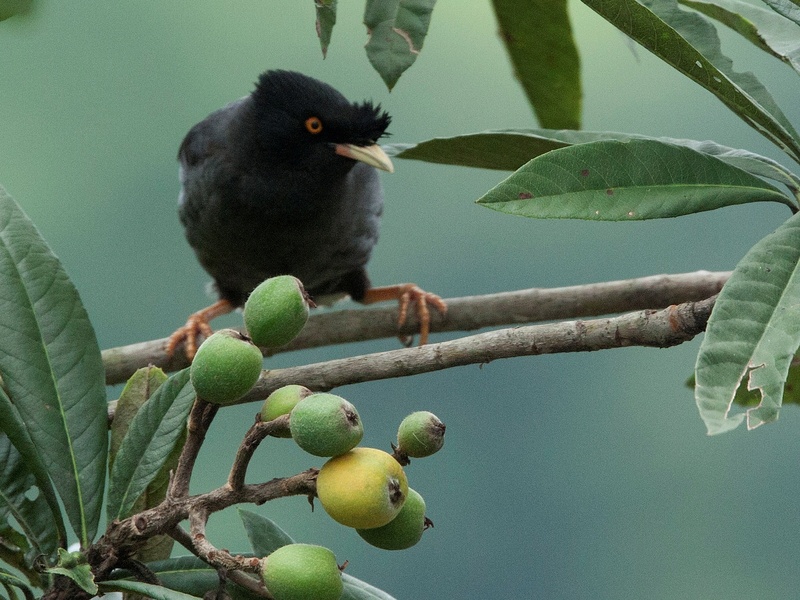 On Saturday afternoon, we visited the little island where the Courtois’s Laughingthrushes breed, which was lovely in winter, too, and the only location in my entire three plus weeks in China where I saw woodpeckers. 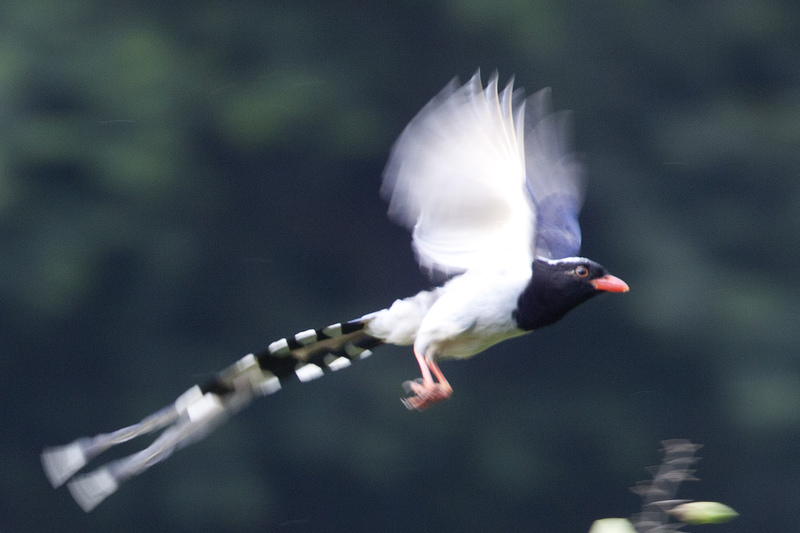 We saw one of Wuyuan’s avian stars, Pied Falconet, and watched it go after (unsuccessfully) an Orange-bellied Leafbird that was larger than the Falconet. 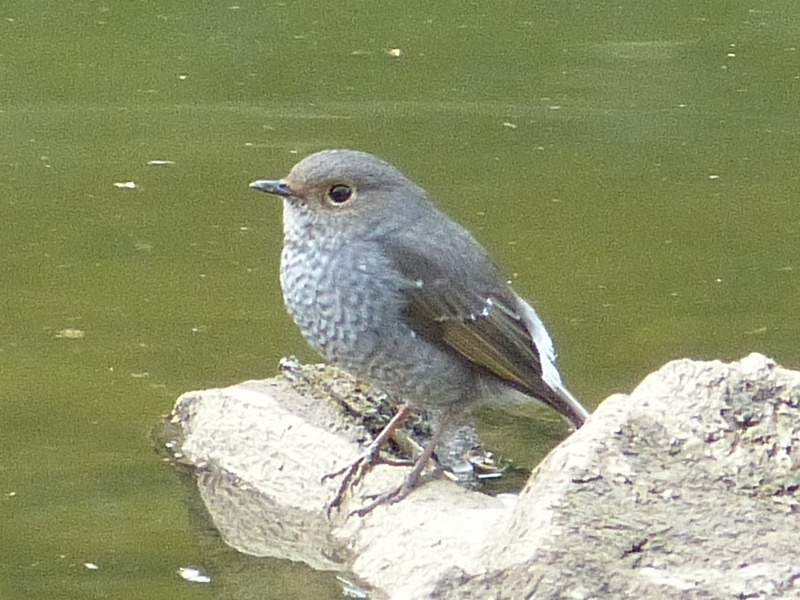 A lovely female Plumbeous Redstart entertained me for quite a while as she sallied up for insects and then repeatedly landed on the same rock in the river. 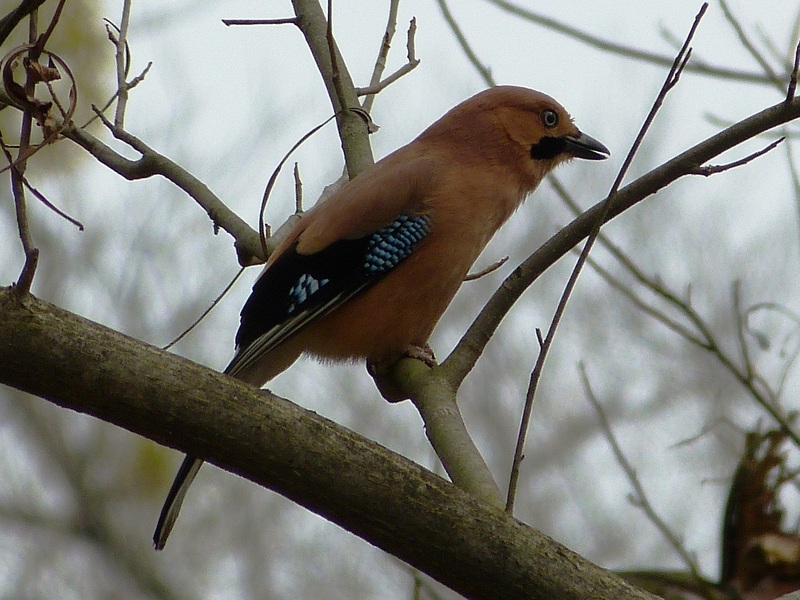 Eurasian Jays were as gorgeous as I remembered from my first visit. We completed Saturday’s birding with a drive along the river, again hoping for Scaly-sided Mergansers, but not finding them. At dinner that night, we talked about our options. Menxiu’s plan was to return to the same spot we had birded in the morning and walk the nearly impenetrable jungle path by the river. This “path” through thick bamboo was the only birding that I had opted out of on our 2012 trip. I had simply said that I could not do it and waited under a lovely tree by the river while the others continued pushing through the jungle. This time I whined and complained, but Menxiu was confident that we would see the mergansers in the river along that trail, so I agreed to his plan. That Saturday night dinner was our third or fourth meal at the same restaurant in Wuyuan. Menxiu liked it because it was on a side street where the locals ate. What I remember is the toilet. In China, they do not have “restrooms” or “bathrooms,” but simply “toilets.” This one featured the usual squat toilet, but it had a bonus – a tub of water right next to the toilet with four fish swimming in it. While it seemed odd to me, later Trissie told me that Chinese would never buy dead fish as we do. They want their fish fresh so will only buy them live. At that restaurant, you could visit the toilet and pick out the fish for your meal at the same time! I have to say, though, that I generally enjoy the food in China and have never been sick there with anything other than a cold. Another Wuyuan specialty is green dumplings. I had fallen in love with them in 2012 and enjoyed having these wonderful dumplings for breakfast both mornings in Wuyuan. I scrutinized them a little closer this time and it appeared that the filling was tofu and vegetables. They are perfectly seasoned and great with hot sauce. Menxiu surprised me on Sunday morning with a drive to the river in our van rather than a return to the dreaded jungle path. We found a pair of Scaly-sided Mergansers right away and got good looks at them. We enjoyed the rest of the morning walking a road alongside the river. 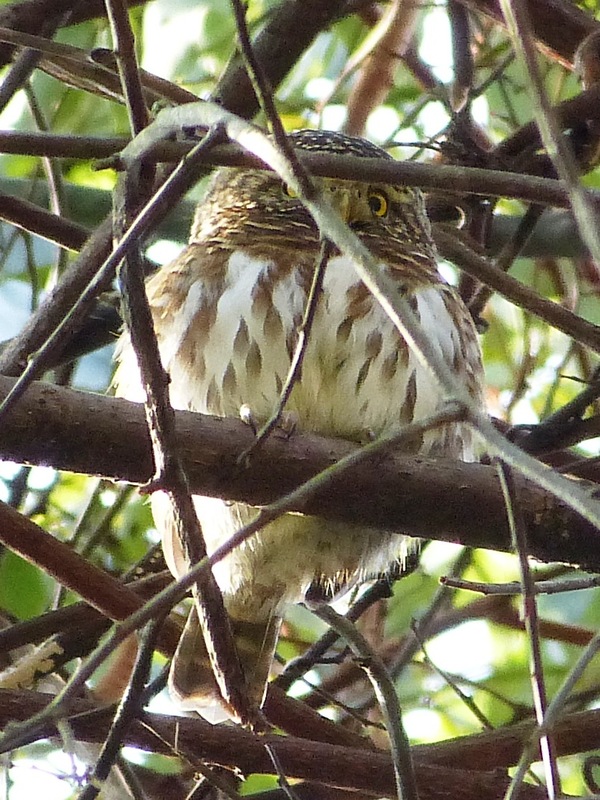 While I had missed a lot of birds earlier in the trip due to my poor vision, I saw nearly everything that morning. 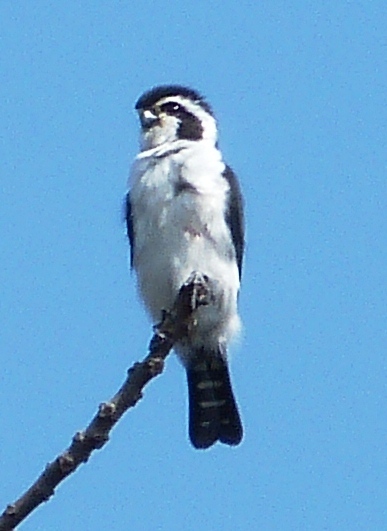 And, what wonderful birds we saw! 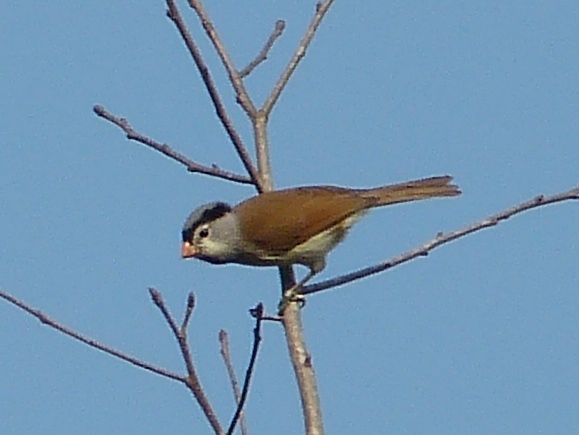 A flock of Gray-headed Parrotbills were right over our heads in a little rice paddy. Several Gray-sided Scimitar-Babblers allowed us quality views, including one bird just a few feet away foraging on the ground and oblivious to our presence. Other sightings that morning included Mandarin and Spot-billed Duck, Black Eagle, Brown Crake, a male Fork-tailed Sunbird glistening in the sun, and my life Red-flanked Bluetail. It was a magical morning that I will always remember. After lunch, we returned one more time to the Laughingthrush island, and then headed to Nanchang and the airport. We had found all of our target birds and enjoyed some wonderful winter birding. Thanks to Menxiu Tong of China Wild Tour for leading this private trip for me. 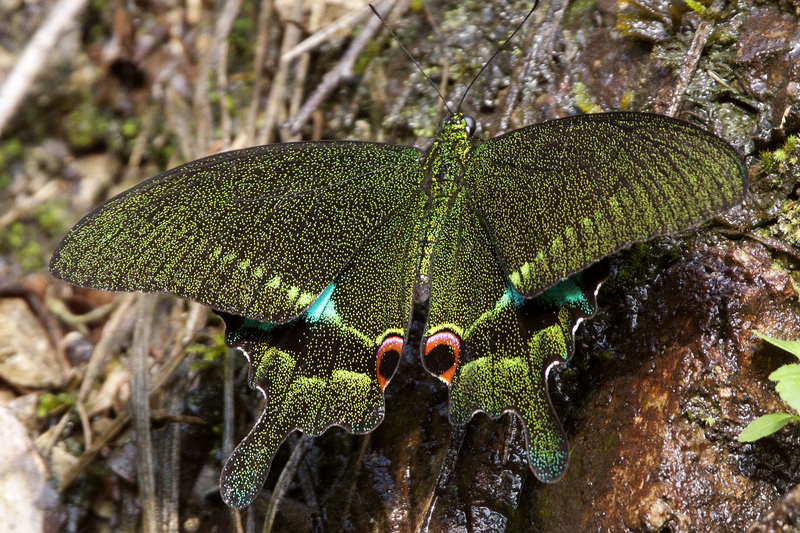 Menxiu’s photos of the trip can be found on Facebook in his album Poyang Lake and Wuyuan Birding Tour, February 2014.